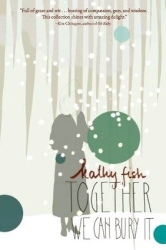 Kathy Fish's stories have been published in Indiana Review, Denver Quarterly, Guernica, Slice, and elsewhere. Her work is forthcoming in The Lineup: 25 Provocative Women Writers (Black Lawrence Press, 2014). She is the author of two short fiction collections, Together We Can Bury It (available now from The Lit Pub) and Wild Life (Matter Press, 2011). Spanning nearly a decade of Kathy Fish’s writing, Together We Can Bury It draws heavily on the author’s Midwestern roots. Like the changing seasons, themes of childhood, siblinghood, and adult loss and betrayal are woven throughout these stories. Click on the cover to view the book at The Lit Pub. Kathy, I tried this exercise shortly after it was posted and have to say that was the fastest 600 words I've ever written! I'm now working on the third story to come from it, so thanks! I look forward to reading Together We Can Bury It. Wow, that's great, Deb! It always works for me.Thrilling to hear you now have three stories from the exercise. Yay! What a genius idea! Thanks, Kathy. If you give it a try, Jayne, let me know how it worked for you. Thanks! Love this. Can't wait to try it--and introduce my students to this fantastic idea. Yay, thanks Randall! Please let me know how it turns out with your students.